God was with Joseph, and He made him very successful. Soon he was working in his master’s own house. His master realised that God was with [Joseph], and that God granted success to everything he did. (39:2-3). God was with Joseph, and He showed him kindness, making him find favour with the warden of the dungeon. Soon, the warden had placed all the prisoners in the dungeon under Joseph’s charge. [Joseph] took care of everything that had to be done. The warden did not have to look after anything that was under [Joseph’s] care. God was with [Joseph], and God granted him success in everything he did. (39:21-23). What happens? “The chief steward did not remember Joseph. He forgot about him.” (40:23) The doubling of the verb is powerful. He did not remember. He forgot. The one time Joseph tries to be the author of his own story, he fails. The failure is decisive. What we want to happen, happens, but not always when we expect, or in the way we expect, or merely because we wanted it to happen. God is the co-author of the script of our life, and sometimes – as here – He reminds us of this by making us wait and taking us by surprise. This is the paradoxical interplay of fate and freewill. As Rabbi Akiva said: “All is foreseen yet freedom of choice is given” (Avot 3:15). Isaac Bashevis Singer put it wittily: “We have to believe in free will: we have no choice.” We and God are co-authors of the human story. Without our efforts we can achieve nothing. But without God’s help we can achieve nothing either. Judaism found a simple way of resolving the paradox. For the bad we do, we take responsibility. For the good we achieve, we thank God. Joseph is our mentor. When he is forced to act harshly he weeps. But when he tells his brothers of his success he attributes it to God. That is how we too should live. Covenant and Conversation 5777 is kindly supported by the Maurice Wohl Charitable Foundation in memory of Maurice and Vivienne Wohl z”l. 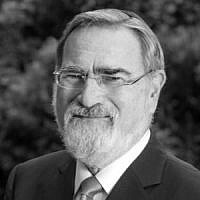 To join Rabbi Sacks’ mailing list, please subscribe via www.rabbisacks.org. You can also follow him on Twitter, Instagram and Facebook. ‘Essays on Ethics’, the new Covenant and Conversation companion volume by Rabbi Sacks, is now available to order here. The Covenant & Conversation volume for Bereishit is also available here.